The newest Inspired by Stamping stamps come out on Thursday and today is the first sneak peek of the sets. 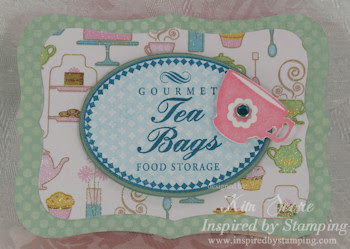 For my projects, I used the Tea Party 6x8 set and the Yummy Food Labels 6x8 set. First, this box was created using the cool technique called a Slider Box. 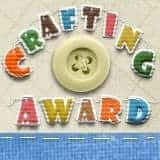 The tutorial can be found on Splitcoast Stampers HERE. When you pull the drawer open, a message slides out on the other end (as shown in the first picture). For the top of box, I stamped the gourmet label with not quite navy ink onto coordinating designer paper then I cut out (removing outer oval on frame). I stamped another label with pear pizzazz ink onto pear designer paper and then cut out entire label. Layer the 2 pieces with dimensionals. Cup was stamped, cut out and attached with dimensional (jewel brad in center). For the top and bottom of box, I used the Nestabilities Label #8 die. 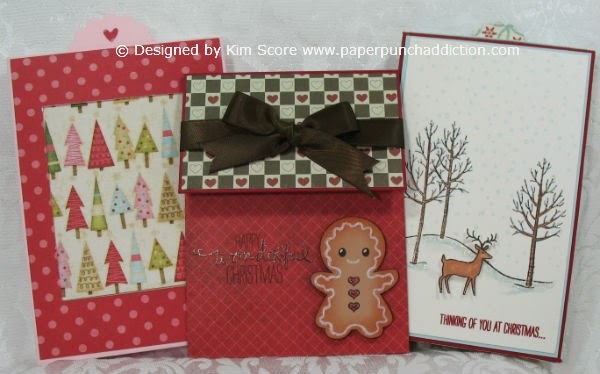 For this next card, I wanted to use this same pretty sparkly paper (from DCWV). The ribbon is silk seam binding from Stampin' Up. It looks so much prettier in person with all of the sparkly paper! For my last card, I combined a greeting from each stamp set to make my own special greeting. The cupcake is a builder punch from Stampin' Up!. I inked up part of the "You're my cup of tea" stamp from the Tea Party set and stamped that first. Then I stamped the "Sugar" from the Yummy Food Labels set. This paper was all glittery as well. Too bad you can't tell from the pictures. I guess I was on a pink and blue kick this week! Some of the other design team members have great projects to share as well. Check it out! Would you like a chance to win one of the new sets? Joanna will be drawing a winner from sneak peek comments on Wednesday and Thursday. All comments on all design team blogs will be entered. So, if you take the time to leave a comment on each design team member's posts, you will be entered multiple times! What a great incentive to get out there and see all of the other wonderful creations by the design team! Cute projects! Love the box you created for the tea bags! 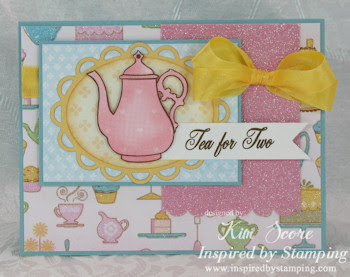 Adorable tea box and cards. Such a cute box- and a great gift holder! I also love your cards! I love the cards and that tea box! super cute. 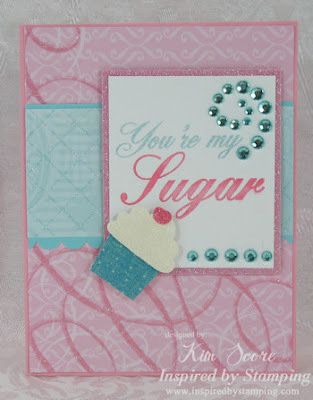 Kim, I love how you paired sentiments together for the 'sugar' card! And that tea box - oh, my! It's so perfect! What works of art you create! I can't wait to see (and use) the Food labels stamp set! Love the tea box and cards ! SO CUTE! Kim as always your set is gorgous. And I have to thank you for all your work everyday. I hate the days I don't see you in my inbox. Wonderful new stamps! 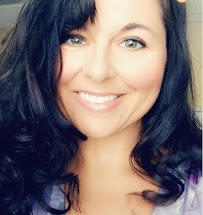 Love what you did with them - thanks so much! Great projects! I especially love that second card. The paper is perfect. Such beautiful creations! Oh this is darling. Love the tea bag box! Love the projects! The tea stamp set is a must have!! 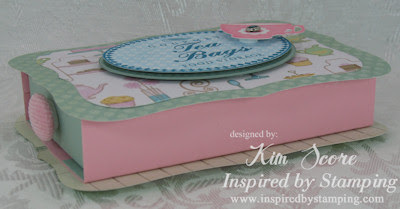 Lovely projects Kim, Thank you for sharing the link to the slide box tutorial. As always...your projects are awesome! Thanks so much for sharing! Really loving the tea themed images!! Great projects. Lovely cards Kim and the box is fab. Those stamp sets are 'souppa' and very useful! Fingers crossed. Awesome projects!!! Love the tea box:) TFS! Love all your projects and your tea-themed paper! So cute! The colors make me think of a lazy spring day perfect for a cup of tea! I love your tea box! Soooo cute! These are beautiful! I love these tea stamps! Very very nice plans! bravo! I love a lot.